Create this adorable holiday gift idea with your child’s handprints. 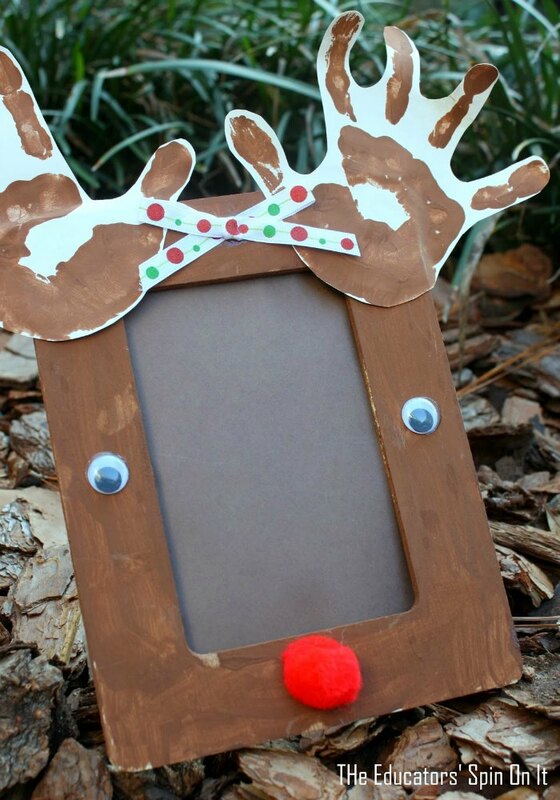 This Reindeer Craft Frame is sure to be a keepsake for years with loved ones ! 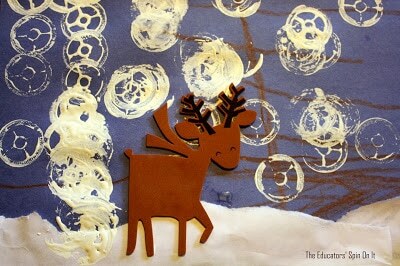 Sleigh bells ring and children craft! Parenting during the holiday season is a must in my opinion. With all the hustle and bustle of the holiday preparations, children still need their daily routine, creative outlets and learning opportunities. We must make time to interact with our children a priority. No time for activities during the week? Prepare a bunch of activities to do together on the weekend. What is great about December is that most of these holiday crafts can also double as hand-made gifts for family members! 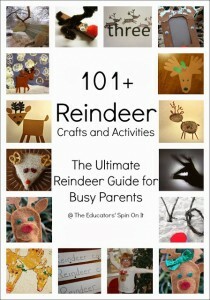 Who wouldn’t want a collection of your child’s cute crafts? 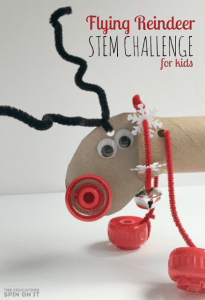 Sign up for our Newsletter for more holiday craft ideas for your child. I often find that we take traditional holiday crafts and put our own spin on them, making those every day parenting moments, learning opportunities. This one is a twist of the hand print reindeer. The original creator – unknown. As teachers, we do a lot of sharing great ideas. This is one of them. Whomever you are that thought of this – you rock! Thank you! Paint your kids hands and press them on white paper. When the wooden frame is dry, glue on bow, eyes, and nose. 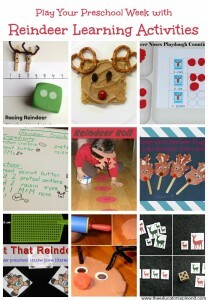 I love this activity because there are so many ways to use it. I am focusing on teaching the sight word can, that words can be different sizes, and the action words. Your focus will be different depending on your child. 1. Introduce the word reindeer. We counted how many letters were in the word and what it looks like; one tall, capital letter followed by 3 short letters, another tall letter and 3 more short letters. Some kids respond well to learning to read by the shapes of words. I also reviewed the [r] sound and that it is found at the begining of the word reindeer. 3. 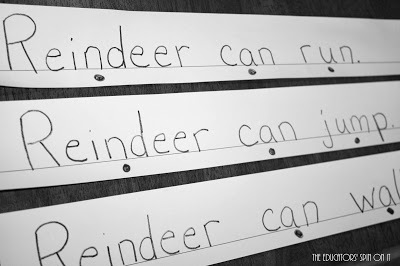 Fill in what reindeer can do. I let him tell me what words to write. He chose run, jump, and walk. 5. If you want, you can cut the sentence apart into words and have your child re-build them. Draw a tree on the blue paper. Rip white paper and glue it to make the snow on the ground. Educator’s Tip: Honestly, we do cute little crafts too that don’t always have a “learning goal” rather are ways that we can positively interact with our kids. This is a pillow that my daughter and I made a while back. Every year she pulls it out and gives it a hug. It is a great reminder that she will always be my little fawn! Thank you for mentioning our Snowflake Ornaments from FB Share Day! Thanks for sharing our fruit salad post with a literacy twist. And, how did I miss the redesign of the header? Looks great! You are welcome – it is such a great DIY ornament for our kids! Amanda thank you for planning next week's activities for me, these are ADORABLE! So thrilled to see all the great activities shared on our Facebook Page today too! Excited to watch Playful Preschool grow this next year! It looks sooo yummy! You always have such great ideas!!! And thank you on the header – Jessica Butler is AMAZING! Awe – you make me blush Kim! Thanks for such kind words! We are in LOVE with Jessica's artwork and can't say thanks enough! More to come! Thanks so much for mentioning our Twinkly Light Caves. So glad you like them! Thanks for linking to our Hand-Printed Gift Bags, Angela! Hope the holiday season is full of happiness and warmth for you!! Since most of what I see online for holiday art is crafts, and very little process art, we should try to do our best to not put all the creative restrictions on the project that are involved in crafts. Let your child do ALL of the project. If you don’t like the look of it, too bad, keep your hands off THEIR work and your opinions about the end product to yourself. Talk about their process. “I see you are pressing hard here and lightly here with that stamp. How do those marks look different?” Open-ended questions support language and critical thinking development. If you help or “fix” your child’s art, you are telling them what they did was not good enough. Also, when you do art alongside your child, be very careful that you are not setting a standard for them and that they feel they must follow you. Often doing art with children says, this is the gold standard and if yours doesn’t look like mine, it’s not good. The same goes for showing samples of “the correct” finished product. I read some of the comments and had to comment myself. Our students are falling behind academically in our country and stifling their creativity isn’t doing them any good.